Our Bible Study lesson began with Matthew 14:22-36, John 6:16-21 and Mark 6:47-51. These are three versions of the story about the disciples leaving in their boat without Jesus; as He stayed behind to pray. Peter still doubting, but exercising boldness, said, "IF it is you, bid me come to you." 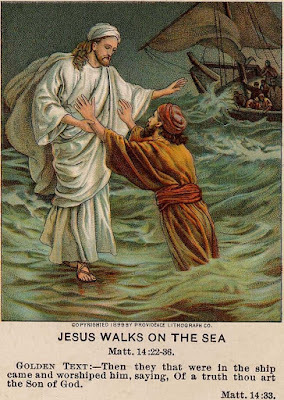 Jesus replied, “Come,” and with courage, Peter made that leap of faith and began to walk on water toward Jesus. Jesus was revealing to them His glory a bit at a time. Later Moses met with God for 40 days on the mountain, and just being in God’s presence caused his face to shine. The people were terrified to see the glory of God surrounding Moses. We must not judge the disciples or the people who were frightened of the glory, because at times we too are guilty. We hesitate to take that extra step and enter the glory cloud where the Holy Spirit will be able to show us great and mighty things. The disciples did not understand that Jesus was to become the sacrifice for the sins of the World. They were being told almost daily, but their understanding was thickened and dull. When John proclaimed “This is the Lamb of God who will take away the sins of the world,” their ears were not attuned to receive truth. They had a different scenario in mind expecting Jesus to take over the government and become King, so they were not open to hear the message of death and resurrection. We question and ask: Why is there suffering, pain, fear, emotional distress and death in this world? Does God do this? As we look at Job, we see that it was the devil that caused destruction to Job’s family and his wealth. God allowed this to happen, but God did not cause it. This was a test to see how Job would respond if he lost children and worldly goods. During the pain and suffering, God revealed himself to Job and taught him that through it all, God was still there with him. God asked Job to lean on Him. God also asks us to lean on Him. Trust is strong and God is revealing his glory to us as we seek Him. Jesus wanted to take his disciples to a higher level of faith - - no matter what circumstance we are facing. The disciples were like a yo-yo believing and doubting even after Christ death and resurrection. Jesus gently was opening up their understanding as he taught them for 40 days. At Pentecost they were infused with the glory of God and began to realize that there was more and God was making his power available to them. If we are in a storm of life, may we learn to praise God IN the storm as praise and worship will bring us peace, because Jesus is taking us safely to the other side. I always admired Peter's boldness, even though he was sometimes impetuous and got into trouble. He was the only one who had the courage to step out of the boat. Thank you for the truths you share. Another great encouragement today. Storm or no storm, there is no rest or peace outside of living His will. Thanks, Hazel. Amen. This is a beautiful reminder to keep our focus to what matters most. May your new year be filled with miracles. Happy 2018! Hazel, I'm asking for prayer for my son's team who will be at Chosen People this coming week. He feels God is opening doors for expanded ministry in this area. Thank you and God bless you.